Cover letter with burned memo from leaker who wrote he worked from 1960 to 1974 in CIA counter-intelligence for James Jesus Angleton, Director, CIA Counter-intelligence from 1954 to 1974. After James Angleton died on May 12, 1987, leaker said he pulled this 9-page memorandum from a fire that was burning up Angleton's most sensitive MJ-12 secret files. All images in this report provided by Robert Wood. 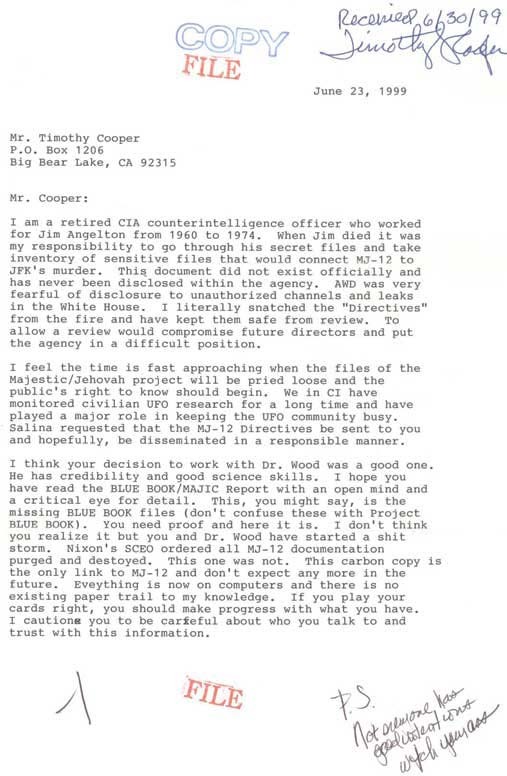 Robert Wood, Ph.D., Physicist and former Aerospace Manager for McDonnell Douglas Corporation, now retired in Newport Beach, California: “The cover letter was written, in my opinion, by the person who says he worked for James Jesus Angleton in counter-intelligence at the CIA. It amazed me that my name was in the letter. And also, it says ‘ -1 ‘ to the left of the red FILE stamp at the bottom of this letter. That presumably was a way of identifying the leaker. We had other leaked documents from ‘-2,’ which was a different address and different kind of information.